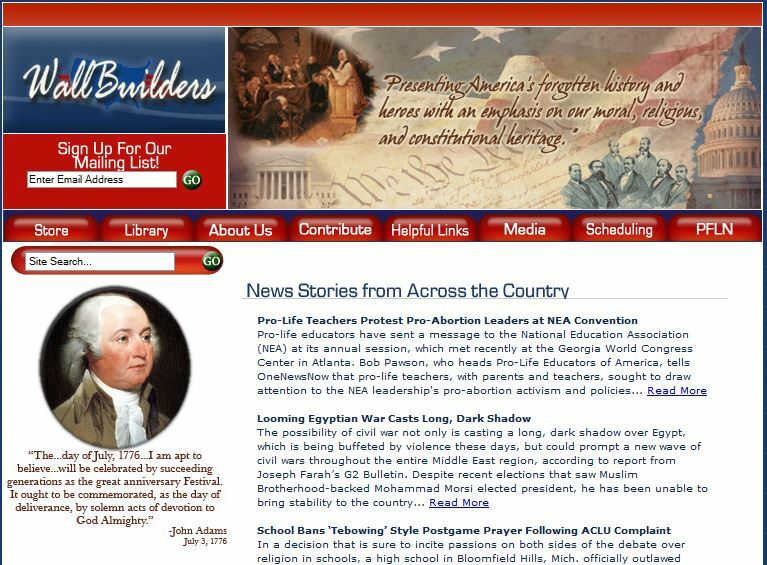 David Barton’s “Wallbuilders” website featured John Adams’s description of July 2 — but conveniently edited out Adams’s own words, to make it appear as something else. Barton misses the history! What sort of anti-American cuts the words of John Adams when Adams defends liberty’s heritage? Other groups make the same error as David Barton’s Wallbuilders, but without obvious cover ups, restricting their comments to “Independence Day.” Accuracy helps, always. “The . . . day of July, 1776?” What day? Faithful readers, and good students of history know that John Adams thought, in 1776, that July 2 would be celebrated as Independence Day. Why? July 2, 1776, was the day the 2nd Continental Congress voted to declare the colonies independent of Britain, and no longer under the rule of the Crown or Parliament. The Declaration of Independence — the press release explaining Richard Henry Lee’s resolution for independence — sat ready to be discussed. The Congress did not adopt the Declaration until two days later, on July 4. Our Independence Day celebration falls on the date of the adoption of the Declaration, not the date of the actual resolution declaring independence. This is a point of great humor among historians. Even John Adams, more prescient than most soothsayers, could not predict accurately when Americans would celebrate independence. Here at Millard Fillmore’s Bathtub, we often make a post on or about July 2, noting that humorous discrepancy. That’s interesting. It’s inspiring to know these august figures, near-gods in the American pantheon of the 21st century, got things wrong. It’s humorous. It’s good history. What in the hell was David Barton thinking? What evil purpose is he trying to serve by hiding real history, in such a bizarrely petty way? Why create a hoax when the words themselves support the point you’re wishing to make, that John Adams thought Americans should celebrate independence? Screenshot of David Barton’s webpage, showing his bizarre butchery of Adams’s words. Sheesh! He comes so close to getting something accurate, but he can’t resist monkeying with the words of the Founders. David Barton reminds me of the guy who cheated at golf so much that, one day when he hit a hole-in-one, he wrote “0!” on the scorecard. A man who will lie to us about one of the most famous letters in American history will lie about anything, for fun. For America’s poster featuring a quote falsely claimed to be from Patrick Henry. The racial right wingers won’t tell you, but the painting is a portrait by George Bagby Matthews c. 1891, after an original by Thomas Sully. It’s baseball season. I love a pitch into the wheelhouse. The radical right-wing political group For America — a sort of latter-day Redneck Panther group — invented this one, and pasted it up on their Facebook site this morning. You know where this is going, of course. Patrick Henry didn’t say that. The poster is a hoax. Your Hemingway [Excrement] Detector probably clanged as soon as you pulled the poster up. Patrick Henry was a powerful opponent to the Constitution. Opposed to the Constitution? Oh, yes. It helps to know a bit of history. Henry was at best suspicious of the drive to get a working, central government after the Treaty of Paris ended the American Revolution. While George Washington needed an interstate authority, at least to resolve disputes between the states, in order to create a commercial entity to build a path into the Ohio Valley, Henry was opposed. To be sure, Washington was scheming a bit, with his dreaming: Washington held title to more than 15,000 acres of land in the Ohio Valley, his fee for having surveyed the land for Lord Fairfax many years earlier. Washington stood to get wealthy from the sale of the land — if a path into and out of the Ohio could be devised. Washington struggled for years to get a canal through — seen today in the remains of the Chesapeake and Ohio Canal from Washington, D.C., up along the Potomac River. Henry was so opposed to the states’ working together that he refused to notify Virginia’s commissioners appointed to a commission to settle the fishing and title dispute to the Chesapeake Bay, between Maryland and Virginia especially, and including Delaware. When Maryland’s commissioners showed up in Fairfax for the first round of negotiations, they could not find the Virginia commissioners at all. So they called on Gen. Washington at his Mt. Vernon estate (as about a thousand people a year did in those years). Washington recognized immediately how this collaboration could aid getting a path through Maryland to the Ohio. Perplexed at the abject failure of Virginia’s government, Washington dispatched messages to the Virginia commissioners, including a young man Washington did not know, James Madison. Washington was shocked and disappointed to learn the Virginians did not know they had been appointed. He suggested the Marylanders return home, and immediately began working with Madison to make the commission work. When this group settled the Chesapeake Bay boundaries and fishing issues, and Washington’s war aide Alexander Hamilton was entangled in a separate but similar dispute between New York and New Jersey over New York Harbor, Washington introduced Hamilton and Madison to each other, and suggested they broaden their work. 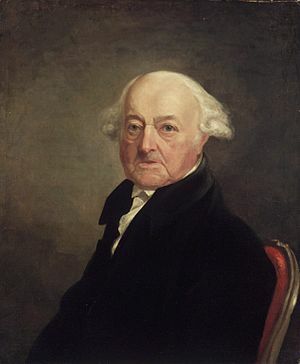 Ultimately this effort produced the Annapolis Convention among five colonies, which called for a convention to amend the Articles of Confederation. The Second Continental Congress agreed to the proposal. When the delegates met at Philadelphia, they determined the Articles of Confederation irreparably flawed. Instead, they wrote what we now know as the Constitution. Patrick Henry opposed each step. Appointed delegate to the Philadelphia Convention in 1787, he refused to serve. Instead, he was elected Governor of Virginia, and proceeded to organize opposition to ratification of the Constitution. Madison’s unique ratification process, sending the Constitution to conventions of the people in each state, instead of to the state legislatures, was designed to get around Henry’s having locked up opposition to ratification in the Virginia Assembly. When the new federal government organized, Henry refused George Washington’s invitation to join it in any capacity. Henry continued to oppose the Constitution and its government to his death. Consequently, it is extremely unlikely Henry would have ever suggested that the Constitution was a useful tool in any way, especially as a defense of freedom; Henry saw the Constitution as a threat to freedom. It is said eight states have adopted this plan. I declare that if twelve states and a half had adopted it, I would, with manly firmness, and in spite of an erring world, reject it. You are not to inquire how your trade may be increased, nor how you are to become a great and powerful people, but how your liberties can be secured; for liberty ought to be the direct end of your government. Anyone familiar with the history, with the story of Patrick Henry and the conflicting, often perpendicular story of the creation of the Constitution, would be alarmed at a quote in which Henry appears to claim the Constitution a protector of rights of citizens — it’s absolutely contrary to almost everything he ever said. And so they trip merrily down the path to authoritarian dictatorship, denying their direction every step of the way to their ultimate end. The rest of us can study history, and discover the truth. Partly because I spent so many years debating competitively in high school and college, I cringe when someone misattributes a quote (it’s rather a sin to do that in debate). 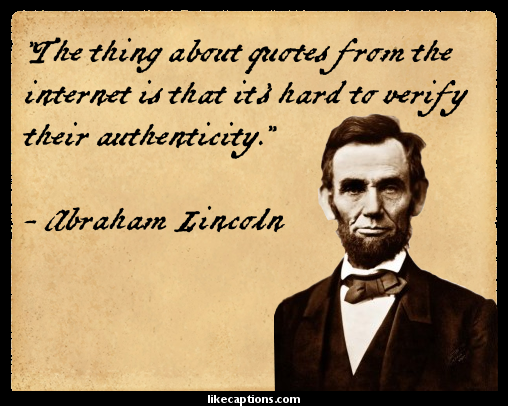 Worse are those “quotes” that get passed around, often attributed to some famous person, which are complete fabrications. Thomas Jefferson is one of a handful of people to whom made up quotes are regularly attributed. Abraham Lincoln is a popular misattributee, too, as are Mark Twain and Albert Einstein (no, Einstein never said anything about ‘compound interest being the best invention of the 20th century’). One would be wise to refrain from repeating anything any speaker attributes to these people, at least until one checks it out to be sure it is accurately attributed. Two circumstances make for “honest” misattributions. I confuse Dorothy Parker and Gertrude Stein comments, inexplicably, so often that I have learned to consult the books before saying who said it, if either one springs to my mind. I am sure that more than once in speaking I have misattributed something to one of these ladies, and I know other speakers do it, too. The second circumstance is when someone hears that misattribution and repeats it — the old line about some one “who hates dogs and children can’t be all bad” is often still attributed to W. C. Fields, though it was originally said by Leo Rosten, in an introduction for W. C. Fields, according to Rosten. Generally people will cheerfully correct such misattributions. Lincoln’s name gets attached to a lot of stuff he didn’t say. He didn’t say this, for example. Other misattributions have more larceny at heart. Novice speakers will put a quote to a name, more out of fear that their audience will believe them more if they cite an authority or celebrity than anything else. Cottage industries built up around inventing misquotes plague two areas of public discourse. Ed Brayton is sensitive to them both, as am I. For some reason, advocates of government displays of religion (which are prohibited by 50 state constitutions and the U.S. Constitution) feel that “quotes” from “the Founders” should carry special legal and persuasive weight, if the quotes indicate that the people who established the United States thumped Bibles as hard or harder than Jerry Falwell at a rhythm-and-blues-themed revival. For example, few weeks go by that I do not get by e-mail a diatribe against “secularism” that claims falsely that our nation’s founders were overweening Christian fundamentalists, as evidenced by the Christian images splattered all over Washington, D.C., and the Bible verses carved in all the public buildings. That is patently false, however. Christian imagery does not predominate in the public art displays in the nation’s capital, but is instead difficult to find unless one is really looking for it. Nor are Bible verses carved in many public buildings — there are perhaps a dozen verses sprinkled throughout the displays honoring knowledge at the Library of Congress, but none I know of anywhere else. These e-mails are not really new. I had heard these claims in speeches, especially at the Fourth of July and at American Legion speech contests, and when I staffed for U.S. Sen. Orrin Hatch, my office was bombarded with such offerings — often with an invective-filled letter asking why public officials refuse to speak the truth. I often took those documents out on lunch-hour excursions to try to match the claims with the monuments: The claims are false. Nope, Albert Einstein didn’t say that, either. Claims continue to be made, and they grow in number and earnestness whenever there is a controversy surrounding an issue of separation of church and state. No, James Madison never said the U.S. government was based on the Ten Commandments. These quotes have great vitality — that false quote from Madison has been uttered by more than one lawyer in the heat of an argument (and no doubt, at least one judge has been unduly swayed by it). Were the quotes accurate, even, they would not change the laws that the founders wrote. Diatribes against Charles Darwin and the theory of evolution also appear to be fertile soil to grow false quotes. One hoax claims Darwin repented of his theory on his deathbed, the “Lady Hope” hoax. Despite Darwin’s children having refuted that story more than 80 years ago, it continues to circulate. Darwin wrote a lot on a variety of different topics, but almost never about religion. The one or two lines he did write about religion are repeated, and bent, numerous ways. Darwin’s assigned task on his round-the-world voyage, was to assemble the scientific data to back as accurate one of the accounts of creation in Genesis. The evidence Darwin gathered told a different story — but Darwin himself did not think that a good reason to leave the church where he had hoped to be ordained. Especially because his wife, Emma, was so devout, he was careful to avoid any confrontation with the church, and on the rolls he remained a faithful Anglican to his death. His funeral was a state occasion, and he is interred in Westminster Abbey. (We can debate whether Darwin was a “good Christian” some other time, with real evidence.) Building on his earlier belief that observing nature is one way to learn the ways of God, Darwin continued to spend his time in careful, astute and well-recorded observation. His work on the creation of coral atolls is still fundamental; his monographs on barnacles are still wonderful reads. Darwin was fascinated with insectivorous plants, and his monograph on those plants is among the first, if not the first. Darwin was patient enough to sit in his laboratory for weeks to see just how it is that vine twines its way around a pole. Darwin was the model of a truly patient scientist. However, when any board of education starts to look at new biology books, you may expect to hear Darwin described as something of an anti-Christian monster and a terrible, sloppy, often-wrong scientist. Then to top it off, people will make rather fantastic claims that his own writings deny his case. Other testimony will make hash of the work of other scientists. Ann Coulter manages to marry both of these worst kind of quote fabrications in her latest book (no, I won’t link to it — you shouldn’t be reading that stuff; go read Stephen Ambrose’s books on D-Day, or Lewis and Clark, instead, and get real mental nutrition.) For those of us who have been watching such things for decades, it is astounding that such slipshod work can get through an editing process and into print. It is interesting to see someone finally merge both schools of scandalous quoting, but disgusting at the same time. As a speech writer, I felt it was important that my clients have accurate material. A politician using a bad quote can find himself quite embarrassed. As a journalist, I worked hard to assure accuracy, and we had regular processes for correcting errors we did not catch earlier. As a teacher, I think it important that we get accurate facts to determine what happened in history. Quotations from famous people make the study of history possible, and fun. Winston Churchill said, “It is a good thing for an uneducated man to read books of quotations. Bartlett’s Familiar Quotations is an admirable work, and I studied it intently. The quotations when engraved upon the memory give you good thoughts. They also make you anxious to read the authors and look for more” (in his 1930 book, Roving Commission: My Early Life). Be sure you get accurate quotes when you read them.